Network Rail has recently confirmed to local Assembly Member, Julie Morgan AM, that they are now working with a preferred contractor on the final design for the Access for All (mid-tier) footbridge at Llandaf station. This new facility, which will be located close to the current footbridge, will have ramped access to both platforms and the project is expected to complete in early 2014. 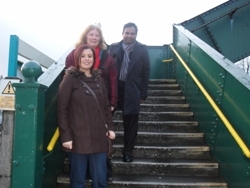 Julie Morgan AM said; “It is good news that plans for a new and more accessible footbridge at Llandaf station are progressing. I look forward to working with Network Rail and local Llandaff North councillors to help ensure this scheme is completed as soon as possible”.